Hello, this is the Los Angeles' meeting help page. We hope this page will cover most problems or queries people have, but if it doesn't please feel free to email us at meeting@icann.org. The best place to start is the front page. A breakdown of events according to day is at the top, then there is information on most other situations during the meeting further down the page. On the right-hand side - as on every page - we have a menu that should lead you through to main areas of interest. You should find everything on the Venue / Hotels page. What room is the meeting in? Every event during the meeting has its own webpage that you can click through to from the schedule/agenda pages. That page should contain everything you need to know including speakers, presentations, time, date, room and so on. The best meeting is to go to a particular meeting's webpage. At the bottom of every page is a chatroom just for that meeting. 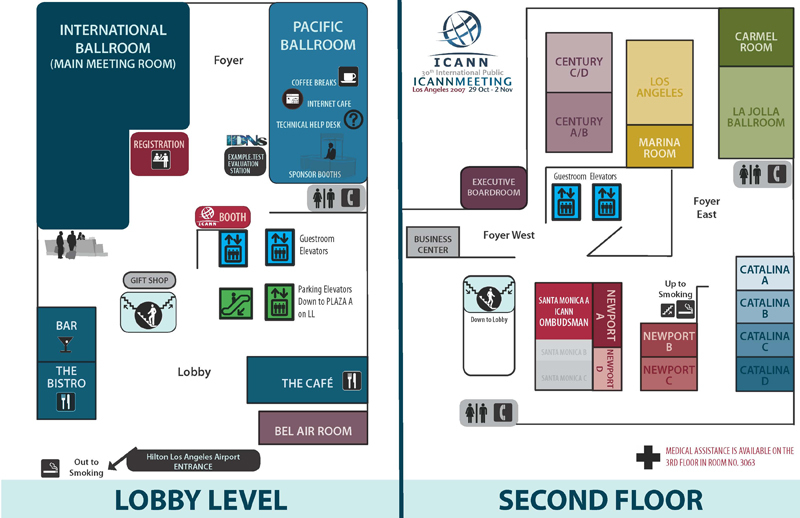 There should always be someone in there while a meeting is going on and they will be able to provide your input into the meeting itself as well as advise you about other aspects of ICANN and interaction. Are you doing interpretation for meetings? Yes. In the main International Ballroom, there will be French, Spanish and Russian translations through the whole meeting. On Wednesday afternoon, Chinese will be included. If you wish to hear events in these languages, simply grab a headset as you walk in the doors and switch to the correct channel. Channel 1: Français Channel 2: Español Channel 3: Русский Channel 4: 中文 In addition, there will be a number of Al Large meetings during the course of the week that will be provided in French and Spanish. There is a technical team that will provide support to the meeting based in Catalina A. They should be able to help with any issues with laptops in the Internet cafe, wireless networks and so on. This hasn't helped and it's urgent - how can I contact you? Go to the Contact page here.